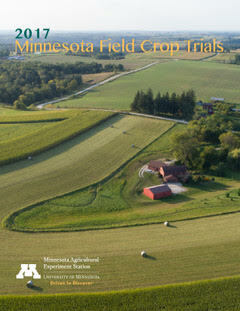 The 2017 Minnesota Field Crop Trials is now available on the Minnesota Agricultural Experiment Station website at https://www.maes.umn.edu/publications/field-crop-trials/2017-crop-trials. Each year, crop scientists conduct performance tests of both public and private varieties of grain, forage, and oilseed crops at several locations throughout the state. This objective information helps producers select varieties and crop brands best suited to their individual situations and locations. 2017 Field Crop Trials include results for alfalfa, barley, canola, corn grain, corn silage, oat, soybean, spring wheat, wildrice, winter rye and winter wheat. In addition to yield results, the trials include information on quality factors, disease resistance ratings and generic traits. To see results for other years or crops not listed above, visit z.umn.edu/croptrials.